If you have any questions or suggestions you are welcome to join our forum discussion about Squeezing Pips from Ranging Markets via RSI . The strategy we are about to discuss is fairly simple and uses the Relative Strength Index to help you determine where the price’s movement is expected to reverse. It is most effective during sideways trading when the indicator’s extreme levels (overbought and oversold) more effectively indicate points of movement redirection. We will be using a daily time frame, but it can work on smaller charts as well. This strategy is somewhat different from the usual RSI overbought-oversold trading because it involves the formation of a reversal bar which gives away a sign of exhaustion in the current price movement. Also, due to this strategy’s exit rules, the trader will almost always be on the market (we will discuss this a bit later). Here is how the trade goes on. In order for an entry signal to be generated, RSI must be in the overbought or oversold areas (we will use default settings at 70 and 30, respectively). 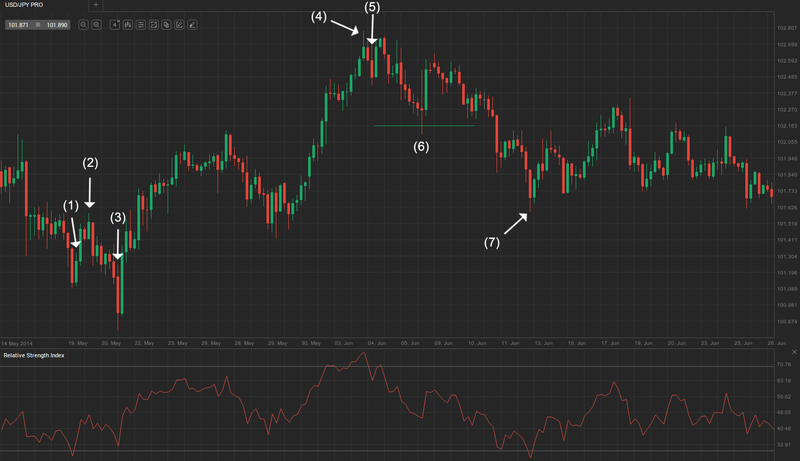 Thus, if we are aiming at a long trade, RSI needs to be in the oversold area (under 30). A price reversal should be marked by the close of a bullish bar, which is accompanied by the indicator rising above 30. As soon as the bull candle closes, you need to enter long on the open of the next candle. Your stop-loss should be placed several pips beneath the most recent swing low in order to avoid random noise triggering it. As for the profit target, you should lock in profits in two increments, i.e. you should scale out. Half of the position should be exited as soon as the price rises by 50% of the risk, thus if the protective stop is 30 pips below the entry, you should close half the position as the price jumps by 15 pips. At that point you should also move the stop-loss to breakeven, thus the worst case scenario for your trade becomes a 15-pip win, instead of the initial 30-pip loss. The remainder of the position is automatically closed, if the stop-loss at breakeven is hit. Alternatively you should exit the market, if RSI enters the overbought area (above 70), reverses and crosses back below 70. The latter scenario is an advantage of this trading strategy compared to most other RSI trading systems because it is designed to get the maximum out of market fluctuations. Because RSI leaving the overbought area is not only a long trade exit spot, but also a signal for a short entry, the market player closes his long position and immediately enters short. Thus, most of the time he remains on the market. The only time when the trader is out of the market is when he is stopped on the remainder of his position at breakeven, or when he is stopped on a false entry signal. Check out the following example. On the screenshot above you can see a four-hour time frame of the USD/JPY cross. At that point the market had been trading sideways for more than a month, which means the first condition for using this trading strategy has been met. The bull trend bar (1) was accompanied by RSI rising above 30, which called for a long entry at the open of the next bar, thus we enter at 101.27 yen. Our stop loss is placed several pips below the most recent swing low which was at 100.75 (not shown on screenshot), thus we put it at 100.68 and we risk 59 pips. According to our strategy, the first half of our trade should be exited at 50% of the amount risked, or in 59/2 = 30 pips, thus at 101.57 yen. It was reached almost immediately at bar (2) and so we move our stop-loss at breakeven. Thus, our trade is now secured and the worst case scenario is the stop on the remainder of the position being hit, which will leave us with our initial win of 30 pips. Sadly, exactly that happened. The market fell to a lower low shortly after at bar (3) and our breakeven stop was hit along the way. Because RSI did not enter the oversold area again, it did not trigger a new entry signal and we missed on the following strong up-move that led the market to a swing high at bar (4). However, the new swing high offered us a short-entry signal. At the bearish trend bar (5) RSI fell below 70, generating a short signal. We sell at the open of the next bar (at 102.48 yen), and our stop-loss is placed 5-10 pips above the most recent swing high, which was at 103.01 yen (not displayed on the screenshot), thus at 103.10 yen. Our first profit target is then set at 50% of the amount risked, or at 102.48 – ((103.10 – 102.48)/2) = 102.17 yen. It is marked by the green horizontal line and was reached at bar (6). As we exit with half of our position, we trail our stop to breakeven. The subsequent pullback failed to trigger our stop and we capitalized on the following down-move. We exited at bar (7), where the RSI entered the oversold area, with a considerable profit, and we immediately re-entered a long position after the indicator left the oversold zone. Forex Trading Strategy - Breakout of the "First Four-Candle Range"